TomoeArts. Composed by Farshid Samandari. libretto and Direction: Colleen Lanki. Music Direction Jonathan Girard. Design by Ines Ortner. A three-year odyssey to create this noh chamber opera which premiered in October 2017. A contemporary (sort of) retelling of the noh play Komachi and the 100 Nights, this opera wove together classical music and noh chant. 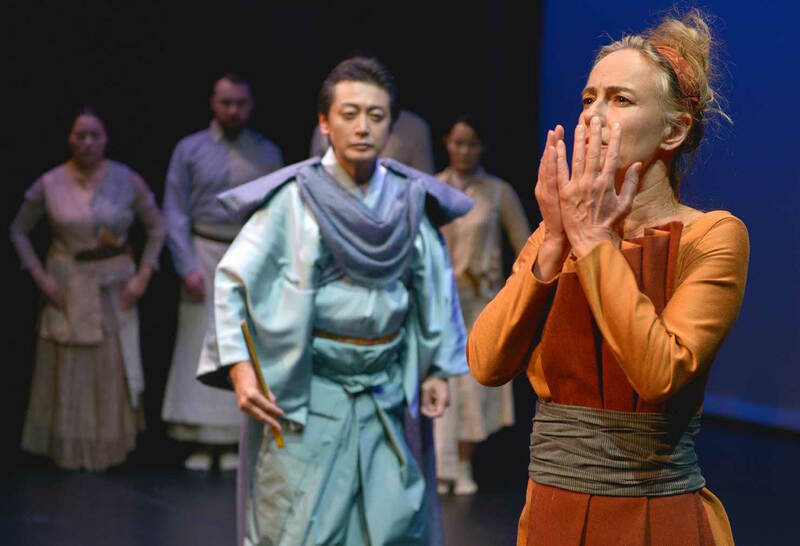 Starring Komparu noh actor Yamai Tsunao and soprano Heather Pawsey, the opera also involved a chorus of four (with two female noh actors) and an orchestra of six. More info on the show. Pacific Theatre By: Maki Yi. Direction: Colleen Lanki. Lighting Design by Chengyan Boon. Funny, touching and a tour-de-force performance by Maki Yi in her one-women show about her adventures coming to Canada. 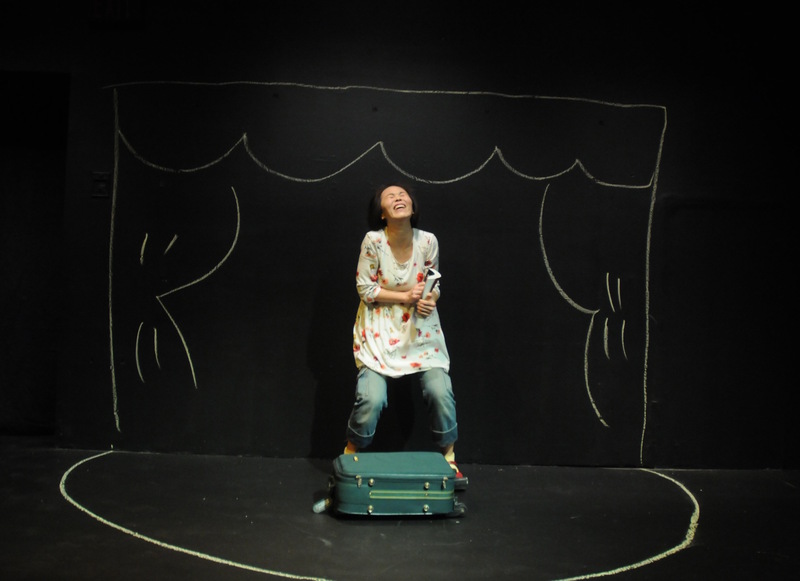 I chose to make this play all about the suitcase...and have everything that appears onstage come from Maki and her luggage. This show is full of crazy characters, a greyhound bus and lots of sidewalk chalk. University of the Fraser Valley. By: Mary Zimmerman. Direction: Colleen Lanki. University of the Fraser Valley. By: Pam Gems (based on Hans Christian Andersen). Direction: Colleen Lanki. The University of Hawaii. Direction: Colleen Lanki. Written by: Kishida Rio. Translated by Tsuneda Keiko and Colleen Lanki. The English language premiere of Japanese avant-garde playwright Kishida Rio's masterpiece Itojigoku . I had the glorious opportunity to be a guest artist at the U. of Hawaii in Spring 2013. The show was a manic and crazy ride - but ultimately won Po'okela Awards (Hawaii Theatre Award) for best costumes, lights, sound and overall production. See a video excerpt here.
. . . a mind-bending evening of surreal theatre expertly interpreted and performed - Scott Robertson, Hitting the Stage 16 April 2013. Complex, metaphorical, confusing and powerful . . . - Nicolyn Charlot, KaLeo April 2013. Produced by Pro Musica Vancouver. Composers: Jennifer Butler, Dorothy Chang, Benton Roarke, and Farshid Samandari. Libretto: Daphne Marlatt. Direction: Colleen Lanki. Musical Direction: Marguerite Witvoet. Written by: Kishida Rio. Translated by Tsuneda Keiko and Colleen Lanki. 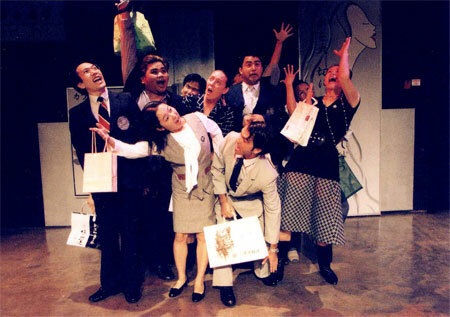 The English language premiere of Japanese avant-garde playwright Kishida Rio's masterpiece Itojigoku . combining movement, electronic and acoustic music, text and projections. The choreographies are based on Japanese classical dance forms/aesthetics, and the newly created soundscape incorporates the shakuhachi (traditional Japanese bamboo flute). Full stage projections add to the uncanny world of the dreams. More Info: Tomoe Arts. Read about the show in The Georgia Straight. Direction: Laurence Kominz. Choreography: Colleen Lanki. Ths was the English-language premiere of MISHIMA Yukio's kabuki masterpiece. 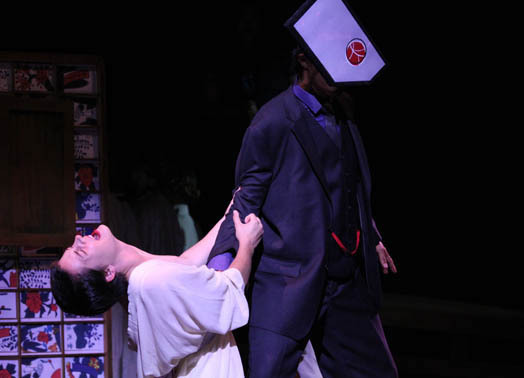 A brilliant comedic piece performed regularly in Japan, this version was produced by Willamette University (Oregon) and featured senior and graduate students. Concept and choreography by Colleen Lanki. Music Composition & Performance by Eien Hunter-Ishikawa, Design by Yulia Stern. Featuring dancers: Tami Mukai and Maki Komori. Part of LIVE's Procession of Performing Circles curated by Glenn Lewis. EN (circle/fate) is about the circular nature of lives, relationships and history. 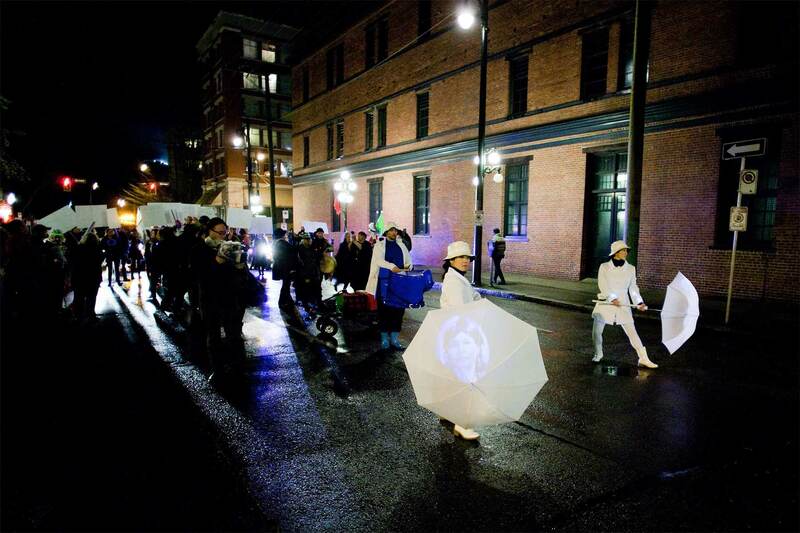 It was created as a short dance for a public art event in which six Vancouver groups come together to light up a few blocks of the Downtown Eastside with music and performance. EN combines Japanese classical dance influenced movement, taiko percussion (played on large plastic tubs!) and projected photographs of local faces. Created with Alcvin Ramos and Matthew Romantini. With projections by Craig Alfredson, David Kim, Yulia Shtern, and Ana Louisa Espinoza Vaca. Concept and choreography by Colleen Lanki. Composition by Alcvin Ramos. Direction by Matt Romantini. 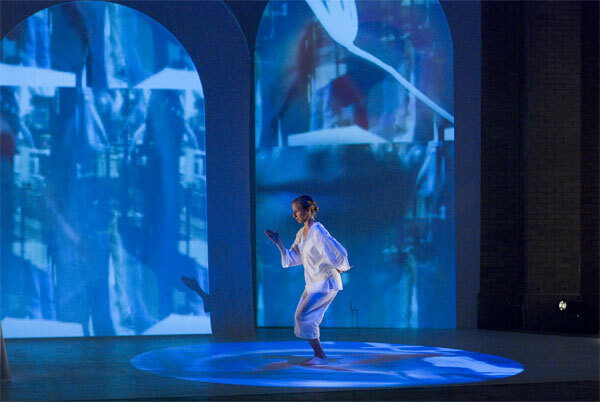 A full-length dance-theatre piece based on Sôseki Natsume's haunting series of tales Ten Nights of Dream combining movement, electronic and acoustic music, text and projections. The choreographies are based on Japanese classical dance forms/aesthetics, and the newly created soundscape incorporates the shakuhachi (traditional Japanese bamboo flute). Full stage projections add to the uncanny world of the dreams. More Info: Tomoe Arts. Read about the show in The Georgia Straight. Written by: William Maranda. Directed by: Colleen Lanki. 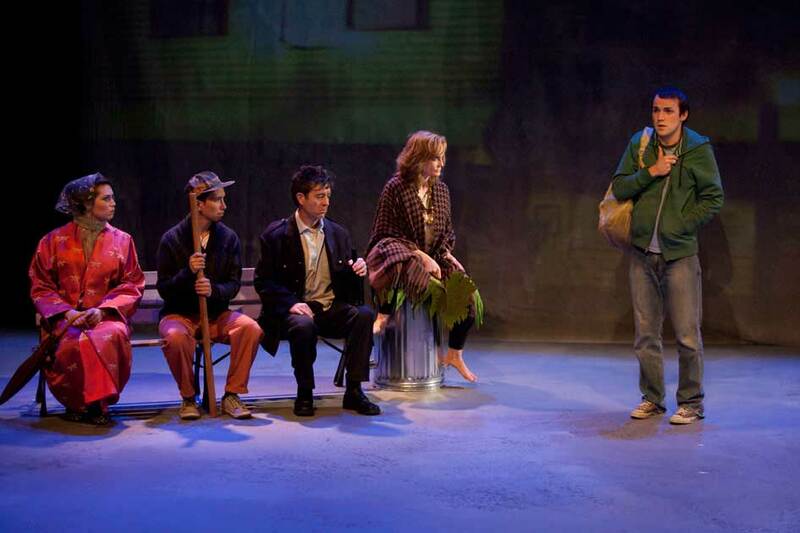 For MyTheatre Company, October 2008. Starring Minh Ly and Mary Phan. 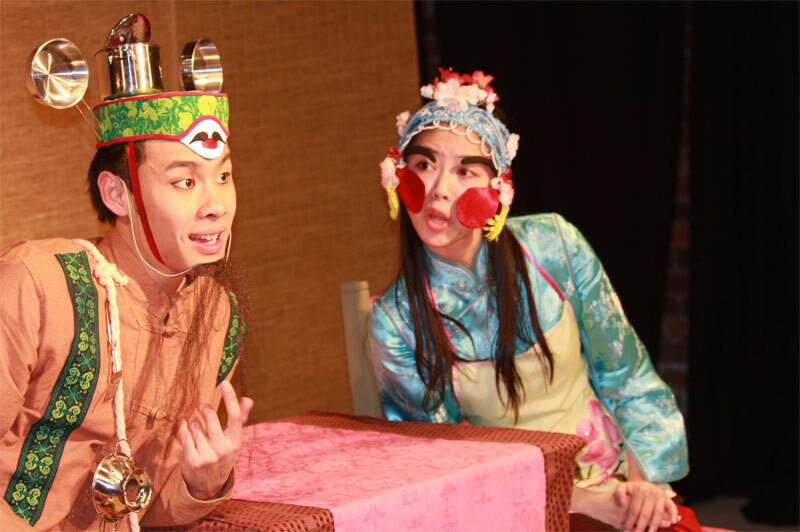 A lovely little comedy - part farce and part fable - to which I added a taste of jingju (Beijing Opera). The show involved some stylized physicality, wonderful percussion (by Nicholas Jacques) and beautiful sets and costumes by Yulia Shtern. Colleen Lanki...delivered this comedy with a flair only an expert in Asian theatre could execute. Ed Farolan. Review Vancouver October 2008. Written by: William Maranda. Directed by: John Wright. ...Colleen Lanki's choreography provides the evening's most exciting moments. Colin Thomas. Georgia Straight 22 May 2008. ...beautifully choreographed by Colleen Lanki. Jerry Wasserman. Vancouver Plays May 2008. 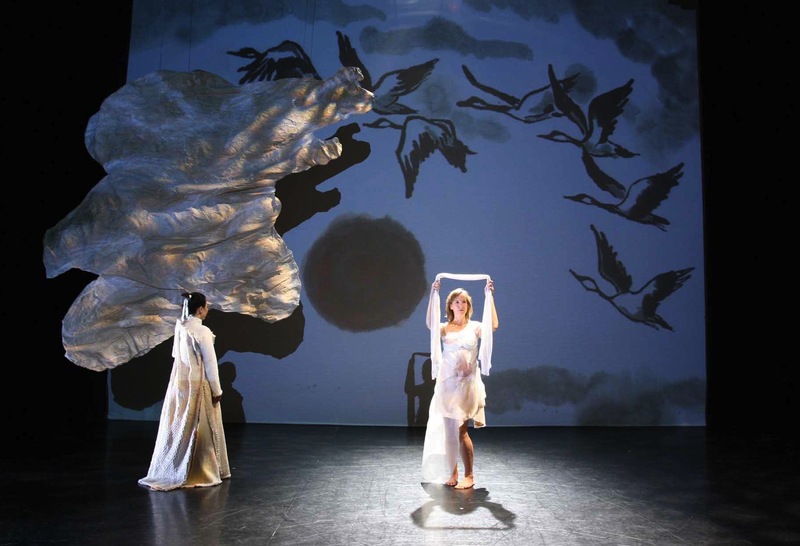 A dance-theatre piece combining Japanese classical dance, noh flute, voice, and text. The Komachi Variations consists of five orignal choreographies exploring the life of the brilliant 9th century court poet Ono no Komachi. 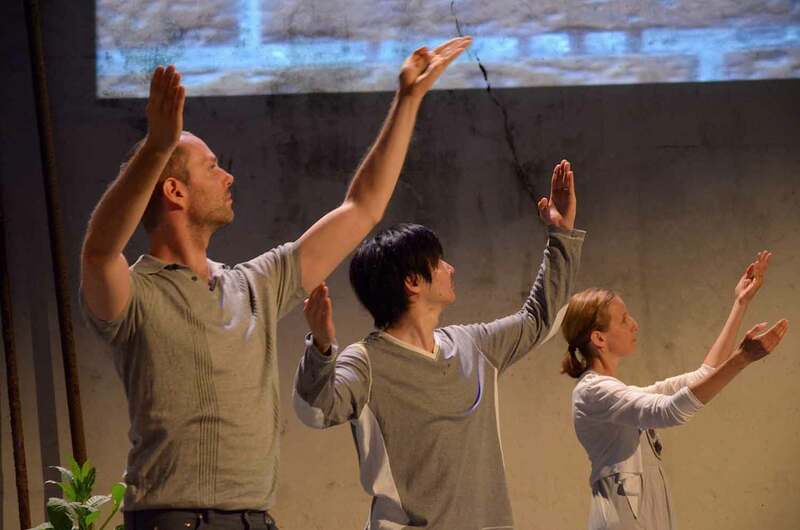 The show has been performed at The Dance Centre in Vancouver, Canada, and as part of the International dance and Theatre Festival at Theatre X(kai) in Tokyo Japan. Ôta Shôgô's 1980s masterpiece is a play that explores the human voyage through a landscape of desolation. 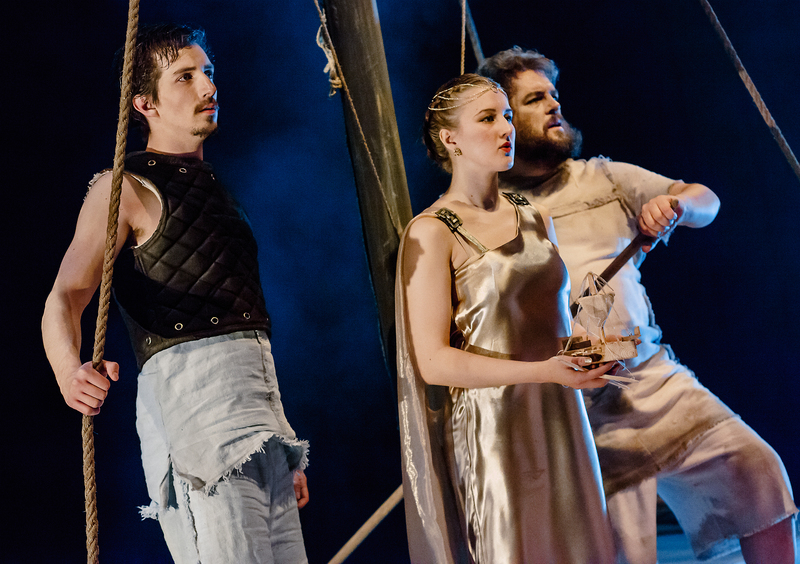 It is a play without words - an embodiment of Ôta's "living silence." Performed at the Great Northern Way Campus as part of a performance/design course which focussed on the aesthetic principles of noh: ma, jo-ha-kyû, and yûgen. This is Japanese playwright Kisaragu Koharu's 1980s expressionist masterpiece. The production was the first time any play of Kisargai's has been produced outside Japan, and the first publication of any of her work in English. MORAL blended realistic acting techniques with stylized movement and vocalization. Direction of the piece relied heavily on the use of Viewpoints. A collaboratively written and created piece dealing with culture, heritage, and blood. The piece combined percussion, projections and a variety of performance techniques. It was performed in: Korean, Laotian, Japanese and English. The Lone Tusker is South Indian playwright and director K.N. Panikkar's exploration into the individual in society. The lead charatcer is a kutiyattam actor who leaves society to explore the forest, and ends up building a new "house" with the wild spirits of the forest. 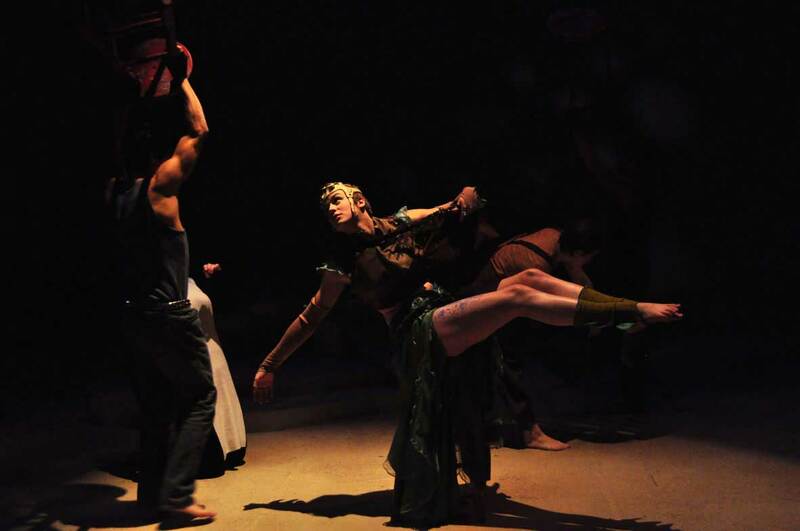 This production invoved actor/dancers from a variety of disciplines: hula, Tahitian dance, and bharatnatyam and explored the splitting or connection of voice and body, having two separate actors embody either the voice or body of a single character. A short interdisciplinary piece incorporating dance, spoken word (Nerida Rand and Lani Hansen), cello (Walter Roberts), and video projections (Kanazawa Makoto). The story follows a woman on a journey back to her lover, to find the journey was what was important for her to really know herself. Performed at Kyozon, Tokyo. A Kee Company production. Movement and exquisite projected text capture four aspects of one woman: The Mother, Ire (the fighter), Marga (the wise woman), and Princess. Performed with Chin Daiying and Aoyagi Atsuko. Performed at plan B in Tokyo. A Kee Company production.